As a premier Tacori dealer, we are proud of the Tacori process and their committment to quality, art and science. We carry the largest collection of Tacori Engagement rings available. 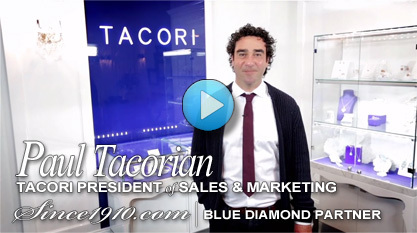 As a Tacori Blue Diamond Partner, one of 3 in the world, we proudly offer 2-3 weeks delivery on all orders. 1-2 weeks quicker than any platinum partner! Add any of our certified diamonds to your setting at true wholesale diamond prices! Can't wait 2-3 weeks for your Tacori ring to be made? No Problem! Shop for Complete Tacori Engagement Rings that include the center diamond.